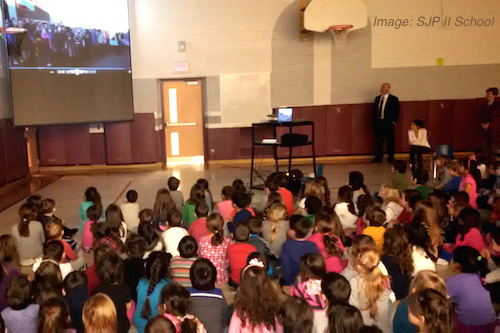 Canadian School Join World’s First Elementary-School Space Mission | Canadensys Aerospace Corp.
TORONTO, ON / 26 FEBRUARY 2015 – Canadensys Aerospace is partnering with St. John Paul II Catholic School in Bolton, ON to provide a Canadian mission control centre for the world’s first ever elementary-school built satellite. The spacecraft, named STMSat-1, was built by St. Thomas More Cathedral School in Arlington, Virginia. The tiny satellite will fly in an orbit 400km above the Earth, similar to that flown by Chris Hadfield aboard the International Space Station (ISS), taking pictures every 30 seconds and transmitting them via radio waves back to the ground. St. Thomas More School won a NASA competition to have their satellite launched into space from the ISS in June 2015. The satellite is the first ever in the world to be built and designed entirely by grade school students, supported by technical advisors from NASA. A central Mission Operations Centre (MOC) will be based on site at the St. Thomas More School in Virginia, augmented by a network of supporting Remote Mission Operations Centers (RMOCs) in various parts of the U.S. and around the world. Canadensys is providing St. John Paul II School with the technology and support required to build and operate an RMOC in Canada. As an RMOC partner school within the STMSat-1 mission, Canadian students from ages 4 to 14 will have the opportunity to experience real-life space mission operations from tracking the satellite as it passes overhead and receiving the transmitted images, to archiving them and interpreting the data received. Students will then upload their captured images to the primary MOC at St. Thomas More School in the U.S. for broader distribution to the global network. The goal of STMSat-1 is to inspire school children in science, technology and mathematics as alluded to by the double acronym. The project is part of Canadensys Aerospace Corporation’s commitment to Accessible Space, providing broadened participation options in space missions across public and education sectors, and leveraging the unique potential of space to inspire and engage. St. John Paul II Catholic Elementary School in Bolton, Ontario, is part of the Dufferin-Peel Catholic District School Board, one of the largest and most diverse school districts in Ontario. For information on St. John Paul II Catholic Elementary School, contact Bruce Campbell, General Manager – Communications and Community Relations, Dufferin-Peel Catholic District School Board at 905-890-0708, ext. 24466 or 905-609-1480. 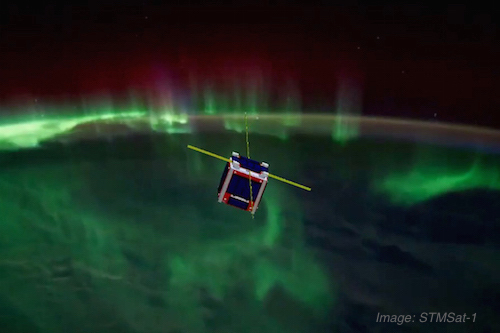 The elementary school-built STMSat-1, due for launch in 2015, shown in orbit passing over the Northern Lights. St John Paul II School students receive their first mission briefing from Canadensys and a welcome from St. Thomas More School.